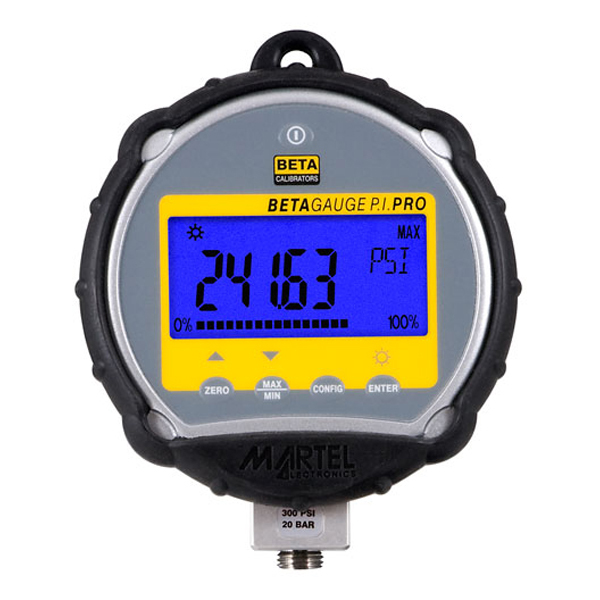 The Martel BetaGauge PI Pro pressure gauge combines the accuracy of digital technology with the simplicity of analog gauges to achieve performance, ease-of-use, and a feature set unmatched in the pressure measurement world. Building upon the proven performance of the Martel BetaGauge PI, the PI Pro includes a new zinc-aluminum alloy high pressure cast housing to improve the environmental integrity of the gauge in a lighter and smaller, yet more rugged, package. The BetaGauge PI PRO provides ±0.05% of full scale accuracy over pressure ranges to 15,000 psig or 300 psia. Additionally, two compound ranges are also available. Readings may be displayed in any one of 18 standard engineering units or in 1 custom user-defined unit to eliminate tedious conversion calculations. The PI Pro includes a 5-1/2 digit digital display. The 0.65" numerals and companion bar graph provide an easy to read display, even from a distance. A number of features provide additional ease of use. 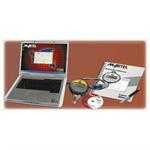 The reading sample rate can be user adjusted to match the type of measurement required. Other features include MIN/MAX function, Auto Power Off and backlight control. In addition to a ZERO function that compensates for sensor drift, large residual system pressures can be nulled using the TARE adjustment. Setting up the Martel BetaGauge PI Pro is fast and straightforward, through a menu-driven display, with minimal text and intuitive functions. A password-protected field calibration may be initiated through the keypad and an RS232 port allows pressure reading data to be extracted directly from the gauge for off-line analysis (requires Martel RS232 cable). Damping can be set to integrate readings to accommodate pulsating sources, such as plant air. An optional external 24 VDC power input is available for applications where the BetaGauge PI Pro will be permanently incorporated into a process line. A protective rubber boot is standard to help protect the BetaGauge PI Pro from damage when dropped. 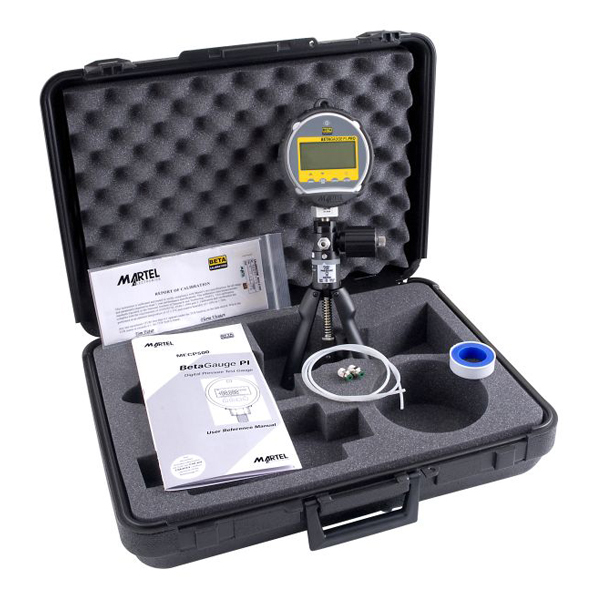 The BetaGauge PI Pro is available in a self-contained calibration kit which includes a test pump (with MECP500 pneumatic test pump for ranges 500 psi and below or a MECP10K hydraulic test pump for ranges above 500 psi), test hose, fittings, rubber boot and carrying case. Vacuum accuracy of the compound range is 0.1% of the 30 psi full scale. Vacuum measurement not calibrated for other ranges. Dimensions: 4.375" x 5.0" x 1.50"